To mark University Mental Health and Wellbeing Day on 18 February, a programme of events is available free to all University staff. 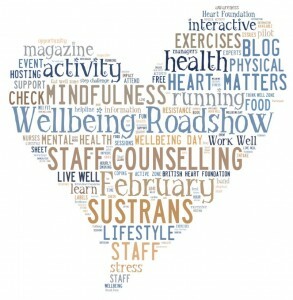 Why not spend an hour to engage with your health and wellbeing at the British Heart Foundation Health and Wellbeing Day event or pick up some advice and information at one of two wellbeing workshops that are running on the day. University Mental Health and Wellbeing Day promotes the mental health of those who live and work in higher education settings. 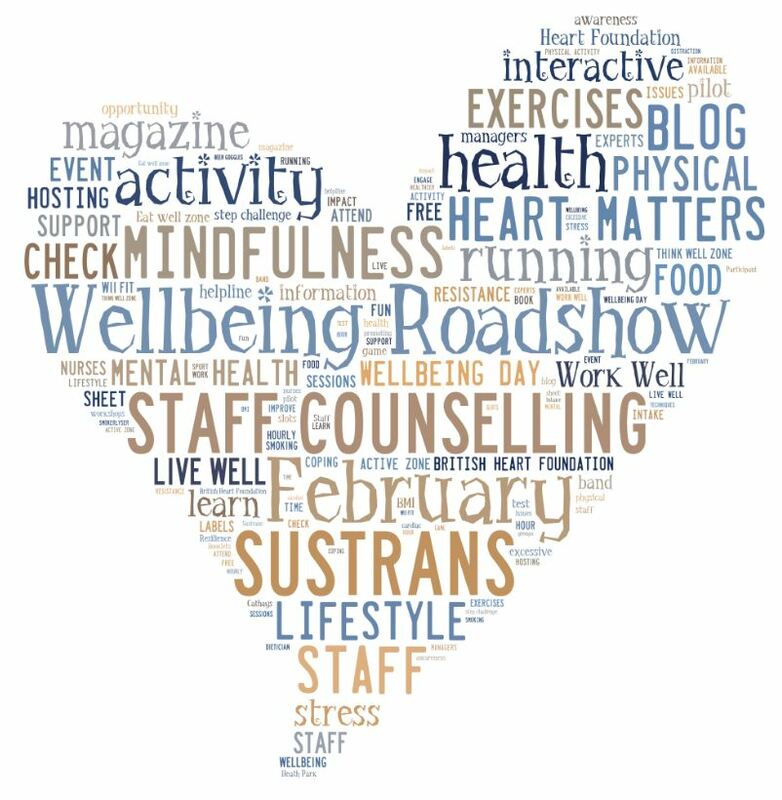 This programme of events is delivered by the Staff Counselling Service and British Heart Foundation, supported by Sustrans. Please use the links below to find out more about what’s on and to *book your place. Please also note that there are ten options listed: four workshop events and six (repeating) one-hour British Heart Foundation Health & Wellbeing Day sessions. Click on the links below for event information and to book a place. Be active zone: Take part in our interactive Wii fit and step challenge to find out how much physical activity can improve health, and how much you should be doing. Eat well zone: Make sense of food labels, get a BMI check and look at food groups in this hands-on session with a British Heart Foundation Dietician. Think well zone: Are you and your colleagues coping with stress in a healthy way? You will learn techniques to improve mental wellbeing with our stress thermometer and active distraction exercises. Changing habits zone: Play the beer goggles game and try the Smokerlyser test to learn about the impact of excessive alcohol intake and smoking on health. You will also have the chance to join Heart Matters, a free service, to help you live with a healthy heart by offering a magazine, an online lifestyle check and a helpline staffed by cardiac nurses. This event promotes the mental health of those who live and work in higher education settings and is delivered by the Cardiff University Staff Counselling Service and British Heart Foundation, supported by Sustrans. *As this event is running during working hours, please check with your line manager when booking an event.